Haven’t processed all of this yet, but this is a great exploration of antifa from a Buddhist perspective. Please read if like me you are troubled by both violence and nazis. I also want to think about this on a “Buddhist” level. What do we expect Buddhists to look like at these demonstrations? Based on mainstream images, we might expect thin, glowy, non-disabled, ‘wise-seeming’ adherents, typically white, occasionally Black. (Thanks, racist erasure.) We might expect them to be sitting in meditation, legs crossed, face uncovered and untroubled. There is nothing wrong with any of these forms, but it’s a problem when our expectations calcify around them. This problem is not new. Chögyam Trungpa Rinpoche identified it in his classic book, Cutting Through Spiritual Materialism. If we’re not careful, we can slide into stereotypes and assumptions about how awakening behaves. What it wears. How it sounds. And that’s where ego creeps in, just when we think we’re being all awakened and marvelous. …My commitments to transforming oppression lead me to seek relationship and solidarity with those actively opposing white supremacy. That means I’m going to encounter plenty of people I disagree with. 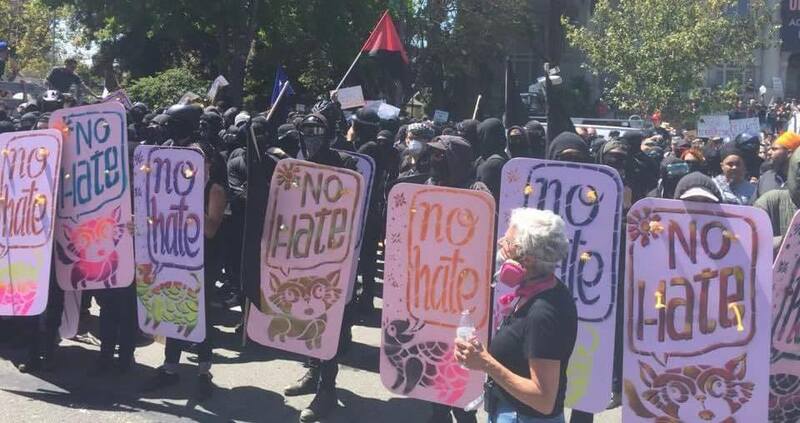 I’m not going to sit here and pretend that some people in Antifa, and some who use black bloc tactics, aren’t animated by rage and a desire for destruction. Even vengeance. But this scares me less, even on a moral level, than those who would pretend that the world’s seemingly endless stream of searing injustice doesn’t warrant our rage. I am unarmed. I will remain unarmed. Buddhist Peace Fellowship will never promote attacking an enemy. But in my mind, this is a profoundly privileged position, almost an accident of luck, and a calling for which I am grateful — not a trophy of righteousness with which to bludgeon others who choose to engage in self defense. Taking heed from spiritual-political revolutionary and writer adrienne maree brown, let’s be honest about whose bodies are at stake, and act accordingly. Violence surrounds us every day, all the time, inescapable. How do we bring about radical transformation (which necessitates destroying many current systems of greed, hatred, and delusion), while remaining as true as possible to a life of awakening and compassion? Read more and join the conversation at The Buddhist Peace Fellowship website.